What the Heck is Flocks of Love? Have you ever seen a flock of 5000+ plastic flamingos? It is really a sight to behold… and you’re about to! This iconic and poignant display of pink flamingos is both breathtaking and lifesaving, and will be open to the public between October 15-31, 2019 on Fripp Island, SC. 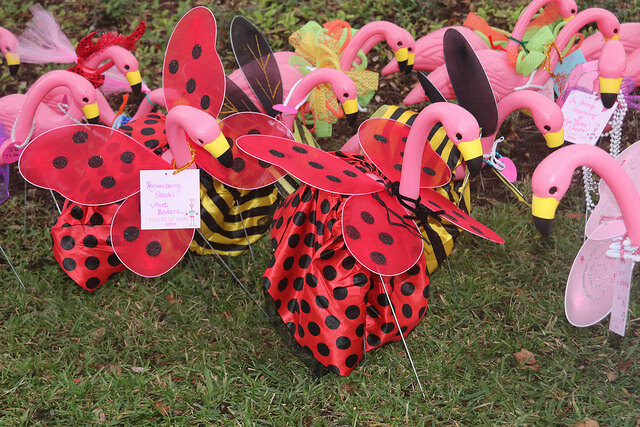 Each bird represents $100 raised in the fight against breast cancer. 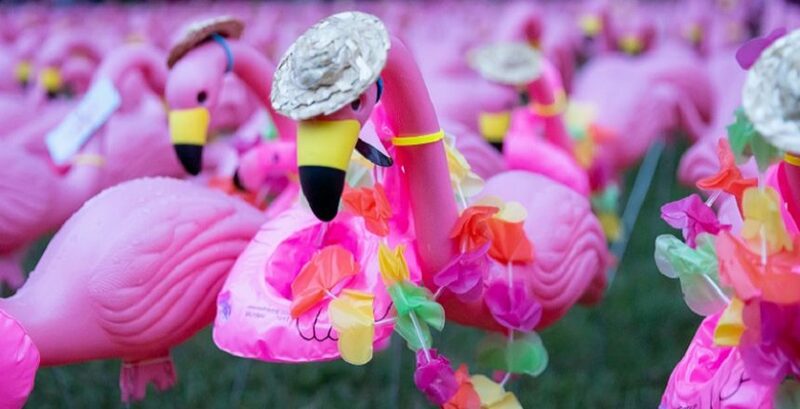 For those of you that make a donation or fundraise on our behalf, there will be one pink flamingo in our flock for every $100 you raised. We will give you a blank “love note” for every $100 you raised. Use them to write a personal message to supporters, donors, or to honor someone special. Decorate your bird(s) however you’d like. Bring doll-sized clothing, make a funny costume, apply makeup… do whatever you want! There will be a contest for best decorated flamingo so go for gold! Friday’s finish line is at the Flocks of Love so we’d like them all to be decorated before then, but you can continue to decorate all weekend long, so no worries! If you would like to receive the fundraising prize packages, please make sure you check the YES box in your dashboard. If you would rather NOT get the incentive prizes, please make sure you check the NO button. If you checked yes and you qualify for prizes (starting at $500 raised), your prize bags will be waiting for you at Packet Pickup. We will have your fundraising totals based on midnight Wednesday (the day before). Prize bags will be made based on those totals. If you bring us additional donations and/or “Facebook proof of contributions” (see below) then we will add those to your totals and do our best to include additional prizes you might have won. Let’s say Mary donated/fundraised $415 via your online fundraising page. We will give her four love notes at Packet Pickup. If she bring more donations with you, let’s say they total $215, we’ll give Mary an additional two notes/birds. Mary will write the names of her donors and/or messages in the cards and then find 10 flamingos that have not been “adopted” yet and put one love note on each of these “naked” birds. If Team Apple raised 5k, they would qualify for Choose Your Charity and we would ask the Team Captain to tell us what breast cancer nonprofit they want 75% of their funds to go to (read more here). 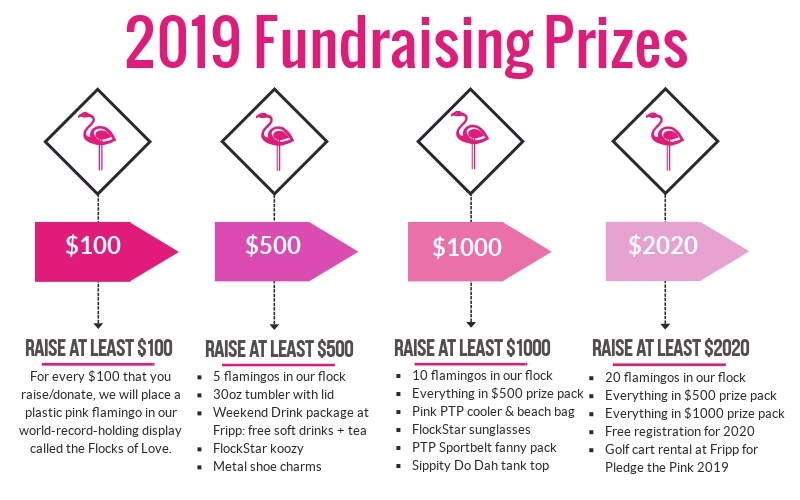 Mary would also get her prizes and flamingos for her portion ($630) and any other teammates that raised at least $100 will each get a bird(s) but would not qualify for any prizes because none of them AS INDIVIDUALS raised at least $500 (which is the minimum for prizes). Any donations made after October 31 will be credited towards 2020 fundraising drive. If you choose to augment your fundraising with a Facebook fundraising drive, we must have “proof of contributions” in order to receive proper credit. Please take a screen shot of your final number and either email that to us or bring a hard copy of it with you to the event. That is the only way we can verify the Facebook contributions and give you credit.